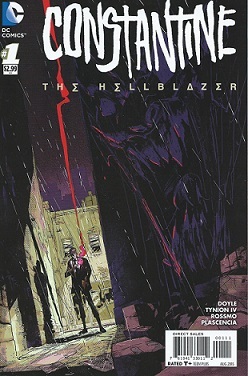 As a fan of John Constantine, and was a faithful reader of the cancelled New 52 Constantine and Justice League Dark series, I had no problem blindly jumping into Constantine: The Hellblazer #1, by DC Comics. Sadly, after reading its debut issue, I wish I hadn’t jumped in at all. John Constantine. Chain-smoking, witty, trickster, extremely smart and quick thinking, occult detective. That’s the guy I looked for, but did not find. Instead I found a guy flirting with a male bar owner (yes Constantine’s gay now), and banging Blythe, a male demon, moments later. (I’ll be posting my diversity in comics rant soon). Ming Doyle and James Tynion are the writers of this disappointing title. This poorly written story is queer as queer can get. Poor set-up, slow pacing, and very wordy about a lot of nothing. No page turners. Amazing artwork by Riley Rossmo. Finely detailed characters. Ivan Plascensia did an outstanding job with the colors. I was bored reading Constantine: Hellblazer #1 before I even finished it. I was so bored and frustrated that I didn’t even want to read issue 2. The only reason I read it was to see if the writing had improved. I purchased both comics on the day issue 3 was released. I’m glad that I left that one on the shelf at the store. I didn’t get much out of this story at all. I know that John Constantine is gay, his “ghosties” follow him whenever there’s trouble ahead (which is all the time for Constantine), and he has to find out who’s killing off his ghosts. I like the ghost killer premise. Kind of like the god killer storylines. I always say that a good story is composed of a well-written script and good visuals. Well, this title has great artwork but is poorly scripted. I will not continue reading this title. I do not recommend Constantine: Hellblazer by DC Comics. I am giving this issue 1/5 stars. 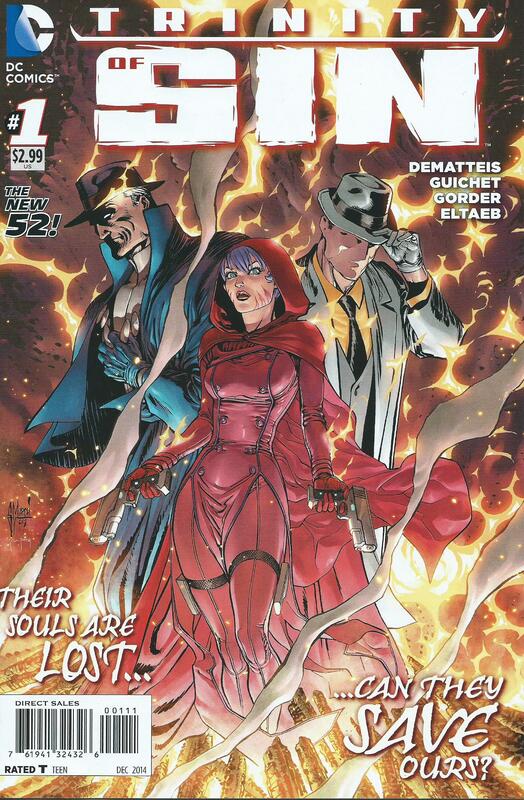 The Phantom Stranger, Pandora, and The Question. The three greatest historical sinners have teamed up to save the world, or have they? Trinity of Sin, DC Comics new ongoing monthly series, has already caught my attention with its amazing debut issue. The Question – Has no recollection of his crimes. Memory erased by the Council of Eternity at sentencing. The Council even erased his face! Fueled by anger and hatred. As a supernatural and comic book fan, I can honestly say that Trinity of Sin is a comic book worth giving a chance. With DC Comics titles that stole my heart such as Demon Knights, Constantine, Justice League Dark, Pandora, and The Phantom Stranger, there was no doubt in my mind that I wouldn’t get hooked on this title. J.M. DeMatteis is the writer. Great script. Perfect timing, not hard to follow. Great character interactions. Loads of suspense, monsters, and black magic. The astounding visuals are provided by Yvel Guichet (pencils), Jason Gorder (inks), and Gabe Eltaeb (colors). I have nothing but the highest of praise for this team of visual storytelling. Take a look at the following panels from the creative art team. 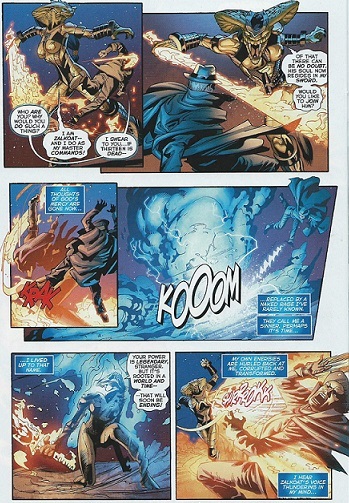 I included a page from Question, Phantom Stranger and Pandora, as they each face their terrifying monsters. Note Eltaeb’s coloring. Beautiful, yet amazingly frightening. There is no doubt I will continue to read Trinity of Sin, a supernatural title that is already living up to its expectations. If you are a fan of comic books, supernatural, magic, and entertaining stories, then you definitely need to read this new series. Even if you are not a comic book reader, give Trinity of Sin a try anyway. I guarantee you will not be disappointed. I highly recommend Trinity of Sin, the new ongoing monthly comic book series by DC Comics. I am giving this issue what it rightfully deserves, 5/5 stars. Dark. Eerie. Creepy. Spooky. Strange. Weird. Mysterious. Supernatural. That is the description of Gotham Academy, a prestigious prep school located in that bizarre Gotham City. 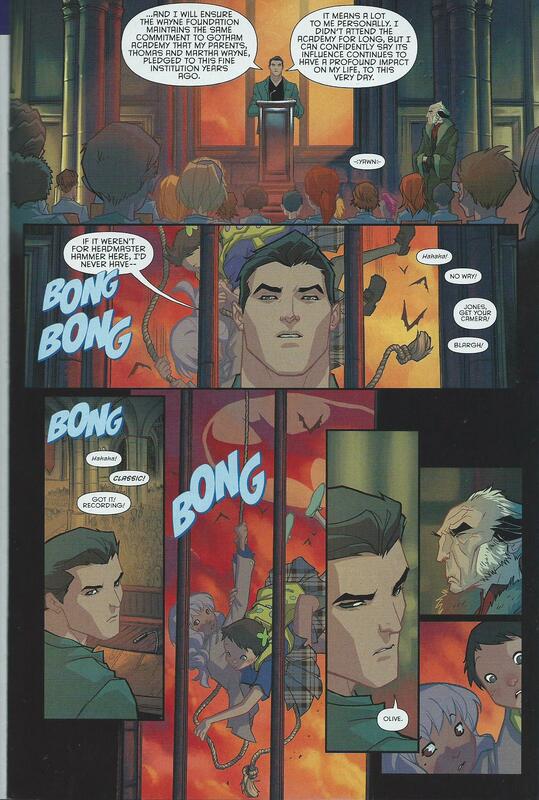 Gotham Academy is obviously unlike any other prep school. The campus is haunted, and some, if not most, of the students act just as strange as the teachers. It is the beginning of the school year, and students are already being warned to stay away from the north hall. Olive Silverlock – Pretty sophomore. Battling personal issues that we don’t know about yet. “Nanny to Maps Mizoguchi. Quiet and socially withdrawn. Wants to break-up with her boyfriend, but he doesn’t know it yet. Maps Mizoguchi – Freshman. Overwhelmingly eager. Outgoing personality. Younger sister of Kyle, Olive’s boyfriend. This strange and fun comic was written by Becky Cloonan and Brenden Fletcher. Perfect story setup. Well-written script, very easy to follow. Great character interactions. I especially like the distinctive character personalities. 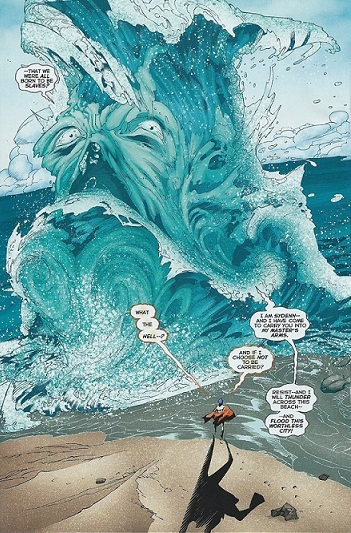 The outstanding visuals were provided by Karl Kerschl (artist), Geyser (colors), and Dave McCaig (colors). I really like the character facial expressions, especially the creepy looking headmaster. My favorite page is when Olive and Maps took a fall while Bruce Wayne was giving the school assembly’s keynote speech. I literally laughed out loud. I enjoyed reading Gotham Academy. I was actually hooked within the first few pages. I definitely plan to continue reading this teen drama comic for at least the first couple of story arcs. If you are looking for comics to read for teens, or just a good supernatural story with lots of strange twists, then I suggest you start reading this new title. I found it to be a good read for all ages. 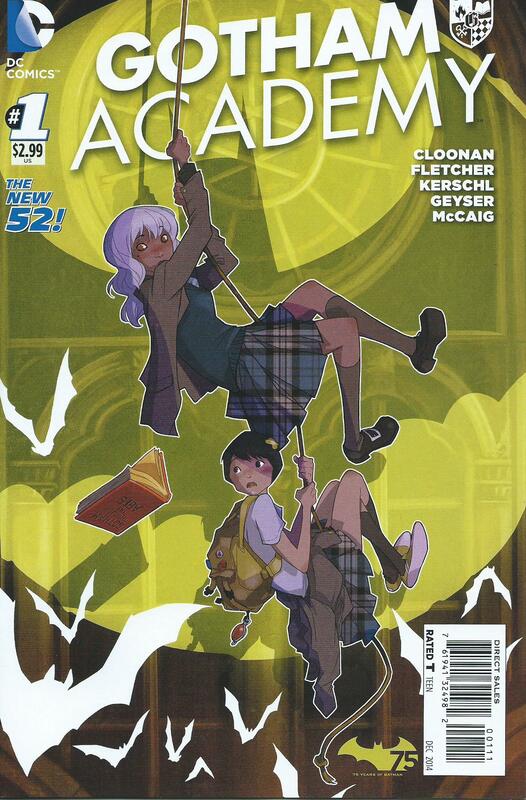 I highly recommend this title, so Gotham Academy #1 is getting what it deserves, 5/5 stars. The New Suicide Squad is back with new players, more chaos, and violence to the extreme. 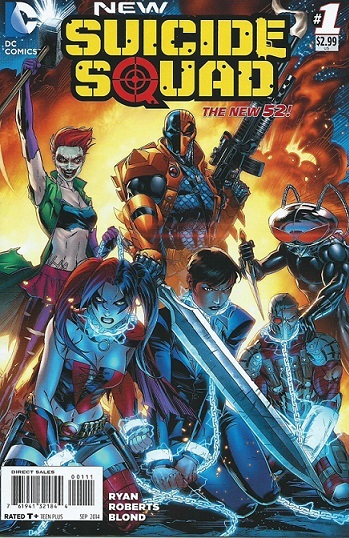 The DC Comics New 52 title is a relaunch of the comic book series that was cancelled a few months ago. Belle Reve is a prison for superhumans. Select prisoners are given the opportunity to have their sentences reduced by participating in a secret government program. Task Force X, or Suicide Squad, participants carry out covert missions, including assassinations. To keep the prisoners in check, tiny bombs are implanted in their necks. Amanda Waller was program director, but she is no longer trustworthy. A new player has been called in to run Task Force X. Victor Sage gets to call the shots, but Waller is still involved with the program. 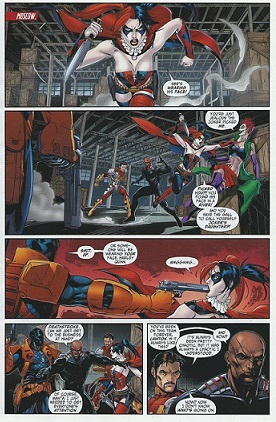 Sage added Deathstroke and Joker’s Daughter to the team, and Joker’s Daughter already has Harley Quinn ticked off. Sean Ryan is the writer of this dark, violent, and exciting series. Sharp dialogue, excellent character interactions. Fast paced but not hard to follow. The outstanding visuals are provided by Jeremy Roberts (artist) and Blond (colors). I have nothing but the highest of praise for the artwork. Realistic features, phenomenal action scenes. Roberts was the winner of the Harley Quinn Talent Competition, and it’s good to see that his talent is not going to waste. I plan to finish the story arc to see where it’s headed. I need to find out how Sage plans to control Deathstroke and Joker’s Daughter since they are not prisoners of Belle Reve, and they don’t have bombs in their necks. I am also interested in Sage and Waller’s business relationship. Waller has always been that woman I love to hate. But Sage appears to be as corrupt as 10 politicians molded together. I have a strong feeling that this title will get added to my pulls. There is no doubt that I strongly recommend New Suicide Squad #1. DC Comics has a lot of great comic titles currently on the shelves, but this series deserves a shot. I just hope it lasts this time. This issue gets what it deserves, 5/5 stars. As long as Skitter do not make an appearance, I may be sticking around this title for a while. 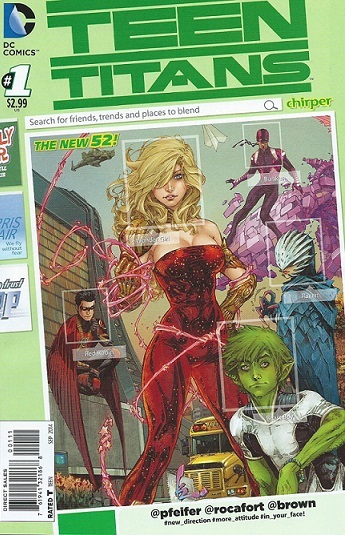 The new Teen Titans series is a DC Comics New 52 relaunch. The title previously launched with other New 52 titles 3 years ago. The teenage superheroes race against the clock to stop a group of terrorists that has taken over a busload of young female students from a preparatory school. The Titans, under the direction of their fearless leader, Red Robin, face-off against the madmen, who are armed with guns and explosives. This cover-to-cover, action-packed issue grabbed my attention from page one. 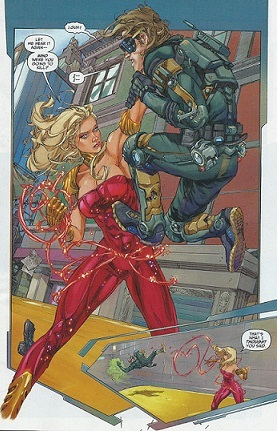 Wonder Girl stole the show in this one. And Beast Boy was not one to be messed with. William Pfeifer is the writer of this fast-paced action script. Great script, phenomenal character interactions. Pfeifer did an outstanding job with story set-up and character introductions. Nice artwork by Kenneth Rocafort (artist) and Dan Brown (colorist). I especially like the characters facial expressions, and the emotion-filled panels that caused my eyes to water. I also like the cover. The only complaint I have about the art is Raven. I DO NOT like Raven’s look at all. 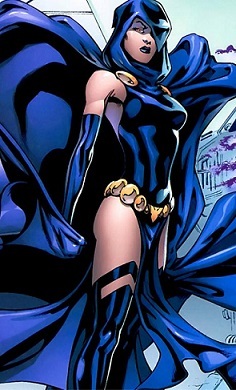 Although I do not like Raven’s look, I can tolerate it for now. At least she looks better than Skitter. Who is Skitter? She was a black female superhero in the previous canceled Teen Titans New 52 series. I had a major issue with the way Skitter was drawn. The white female superheroes were beautiful, but Skitter looked like a giant cockroach. I was deeply offended, and her look grossed me out. The title was on my pulls list from day one, but I stopped reading it after the first few issues. 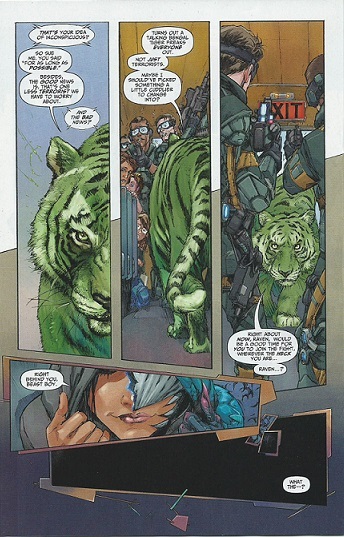 In my honest opinion, which is what this blog is based on, The new Teen Titans has gotten off to a great start. Powerful story, non-stop action. Nice artwork, except for Raven. I plan to read at least the first arc to see where it’s headed. If I continue to like the story, then I will have to make some adjustments to my pulls to make room for it. I highly recommend this title. This issue gets 4/5 stars. The Tiny Titans are back! But only for a minute. There is not a lot of comic books for kids on the shelves, so my children and I are excited for the Titans’ return. Superboy and Supergirl pays a visit to the Titans. But when they arrive, they find the treehouse has gone missing! 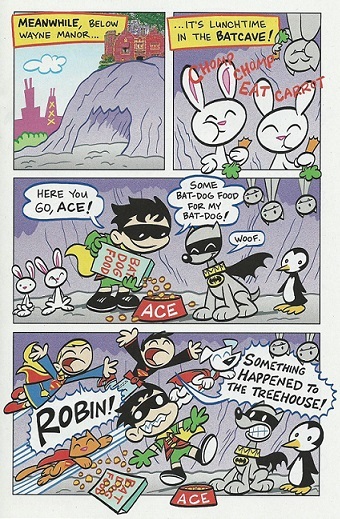 They team-up with Robin to search for the treehouse, and the fun begins. 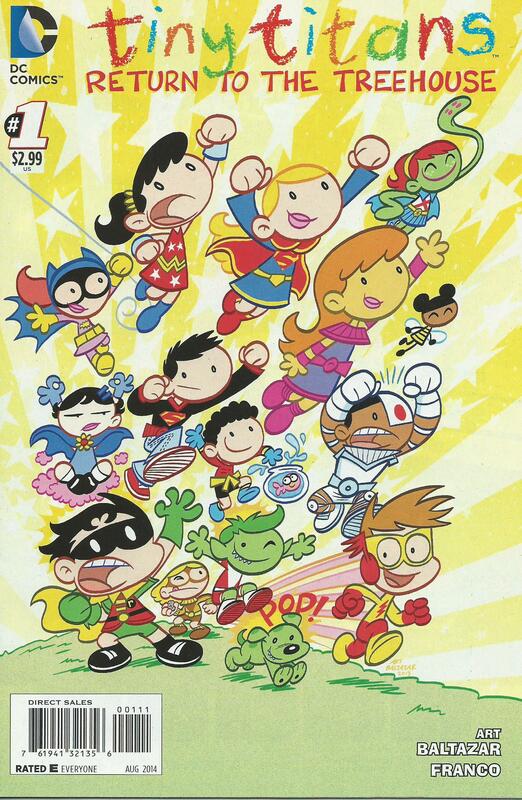 Tiny Titans: Return To The Treehouse is a six-issue mini-series published by DC Comics. Art Baltazar and Franco are the writers, and Baltazar is the artist. Not only was I excited for the return of the Tiny Titans, I was also excited that Baltazar and Franco are the creators of this fun comic. They are no strangers to the Tiny Titans comic series, and this issue is hilarious from cover-to-cover. Funny script, and excellent artwork. 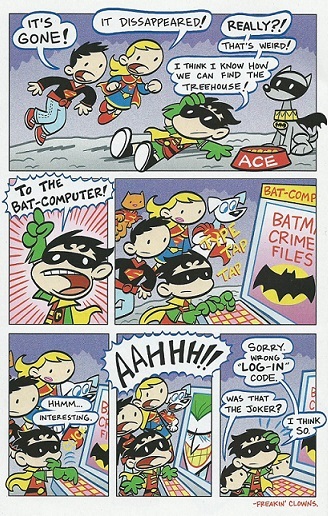 But that is always the case with kid-friendly comics by Baltazar and Franco. My children and I are will definitely read the entire mini-series. If you are looking for comic books for kids, then I strongly recommend this title. This issue gets 5/5 stars.